Maintaining the contact list your Android device in order can be a rather complex task without the right tools. In general, we used to have the contacts of different social networks mixed; we have people in the contact list that we only know the mail, and have friends who appear in the list under four different names. There are several applications on the market that can help us organize our contacts, avoiding duplication and gathering all the information of a person under the same name. 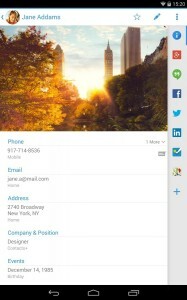 One of the best apps to manage our address book is Contacts+. Contacts+ is a free app that integrates the information coming from the major social networks and other messaging applications. It organizes all this information in an easy and elegant way and provides a very robust and efficient interface. When we install the application for the first time, it will ask to add the profile information of our social networks like Twitter, Facebook, LinkedIn, Google or Foursquare. From here on, we will not only have the contact information but also the profile picture and any other relevant detail that user has included. Once we have all the contacts in the list, we can customize it to our liking. We can change the way that the contacts are displayed, its background color, and the style of the photography shown (circular or square). By default, the 10 most used contacts appear at the top of the list, making it easier to find, but if we don’t like this option, we can disable it. We can also create groups of contacts, bookmarks, favorites, etc. As an additional feature, Contacts+ can receive notifications from our social networks, such as tweets or Facebook posts. We may even respond to tweets, “like” the publications or respond to the posts directly from the application. 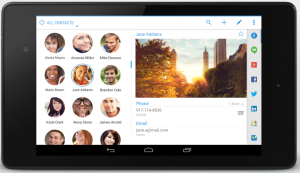 Contacts+ includes a dialer and the possibility to send SMS directly from the application. By simply holding on the picture of one of our contacts, we will bring up quick buttons to call or send a text message to that person. The only “negative” asptect of this app is that the contact list is based on our list on Google Contacts, so if our contacts are an absolute chaos there, the application may do little to improve it. However, if this is not our case and we have the contacts relatively in order, Contacts+ can help us a lot to merge all our social networking apps and messaging under the same interface. Contacts+ is free and it’s worth a try. You can download it from the Play Store.